I gave Carmela Ziino a small bag of green beans on the day I went to interview her. “Thank you,” she said. “I think I make a pasta fajol.” Then she told me how she fixes the hearty peasant dish that has sustained Italian families for centuries. Carmela is a woman who knows her produce. She grows eggplant, tomatoes, broccoli and pole beans in a small plot in her backyard. She stocks her freezer with produce for the winter and stocks the shelves of her basement pantry with tomato sauce. She used to make all her own sugo (tomato sauce), but lately she’s been buying store-bought sauce because it was such a good deal at Walgreens. When the store on Oakland Avenue offered five cans for a dollar, Carmela couldn’t resist the bargain. Even though there was a limit of $2.00 on each purchase, Carmela figured out a way to stock up. Carrying a shopping bag in each hand, she loaded up with five cans on each side and walked home. Little by little, trip by trip, she brought more than 100 cans of sauce home to her basement. That meant a lot of trips walking across the Locust Street bridge, but for Carmela Ziino those trips on foot were no problem. Carmela grew up in the countryside of Sicily. Her family did not have a car. She remembers walking everywhere. She walked to her first job where she wrapped hand-picked lemons and packed cases of the fruit for export. Later, after she was married, she would walk with her three children to visit her mother. That was when her husband Salvatore was in the US working for money to bring Carmela and their children over to this country. Salvatore was born in Milwaukee when his parents lived briefly in the old Third Ward. His American birth certificate made difficulties for him during the war when Mussolini led Italy against the Allies, but afterward it made it relatively easy for him to bring Carmela and their family into this country in 1950. Carmela remembers the long ocean crossing as a misery of seasickness. When she and the children arrived at Ellis Island, the children hardly recognized their father. When they came to Milwaukee they first lived in a tiny boarding house room on Cass Street. Carmela wondered what in the world she had done to move from Sicily to this northern place called Milwaukee. But with the help of Italian-speaking neighbors and the parish community at St. Rita’s church, Carmela and her children settled in. Salvatore had a steady job with the gas company. Always very energetic, Carmela got a job in the school lunch program and watched her children learn English and adapt to life in the US. Tony, Vince and Cona were born in Sicily; Mario was born in Milwaukee. Thirty years ago, the Ziino family bought the brick duplex where Carmela still lives and occasionally makes tomato sauce. Salvatore died suddenly of a heart attack in 1985 and her children are all grown up now. She is proud of her six grandchildren. Tony moved to Tennessee, but her other three children live relatively nearby in Waukesha County. 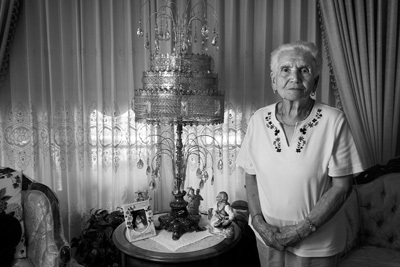 It is from her house on Humboldt Boulevard that Carmela sets out almost every day on her walks. Sometimes she goes to morning Mass at St. Casimir’s or St. Mary’s; sometimes she walks south to Jewel-Osco, sometimes north to Capitol Drive; other days she walks across the river to Oakland Avenue. For a woman in her early eighties, Carmela is remarkably energetic. She does all her own housekeeping and most of her yard work. “It’s a true,” she says. “I got energy and I got courage.” She likes to walk with a friend but she is not afraid to walk alone. She never carries any money and she likes to get the exercise. Her most frequent route is along Humboldt Boulevard. Carmela Ziino may have left Italy more than fifty years ago, but she has carried the traditions of good cooking and daily walking that she learned in her Sicilian village into her life in the village of Riverwest.